Kale, edamame, quinoa salad with sweet lemon vinaigrette. 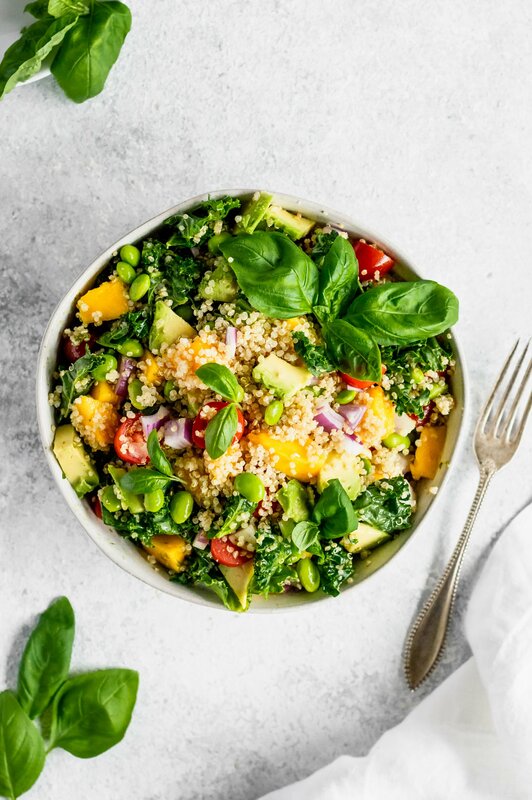 Packed with juicy mango, tomatoes, heart healthy avocado, nutty quinoa and crunchy kale. 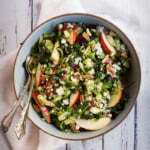 This salad is perfect for parties or for packing for lunch. “It’s coming to a point on my Facebook where everyone is becoming engaged. I don’t know what’s happening? I mean, any time I even think about having a boyfriend I can’t help but laugh; all of the guys I go on dates with are either A) committed to work, B) completely awkward, or C) have questionable intentions. But I guess that’s what happens when you are 23. So for now I think I’ll stick to single lady things until the man of my dreams (who might resemble Joshua Jackson aka Pacey from Dawson’s Creek) comes into my life. Plus if I had a boyfriend I probably couldn’t get away with making him eat quinoa and kale instead of manly beer battered onion rings and cups of BBQ sauce… or whatever Burger King is advertising this week. Reading it made me laugh real hard. Life’s got a funny way of changing quickly. Tony (my husband) and I met when I was 24 (only a year later). He still eats onion rings and pretty much hates all things quinoa (except when I make these truffles). Meh. Years later, I wanted to improve the photography on this post & also bring it to life again. It’s basically the perfect salad for summer party season people. 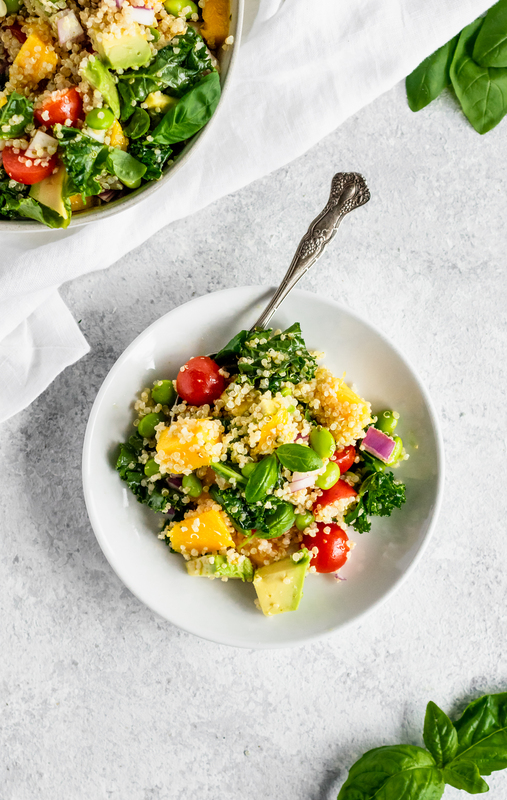 My love of kale salads first began in 2010 when I would always find my mom making a big batch of raw kale salad with lemon, olive oil, garlic, and all the bell peppers. She would let it still a few hours until the lemon juice broke down the kale and the flavors became melded together; it was sensational. If you’re wondering what the trick to a really good kale salad, it’s simple: massage in the dressing with your hands! Sounds crazy, but the dressing actually helps to break down the bitterness of the kale and infuse it with flavor. I wish more people would give kale a try, because when it’s in salads like this, you can’t go wrong. And if you’re new to kale, you might as well put it in a uber delicious salad, right? That’s where the quinoa and edamame come in. Mega protein, naturally gluten free, vegan-friendly, and definitely full of good nutrients. It’s like a healthy little fairy tale I dreamt up. 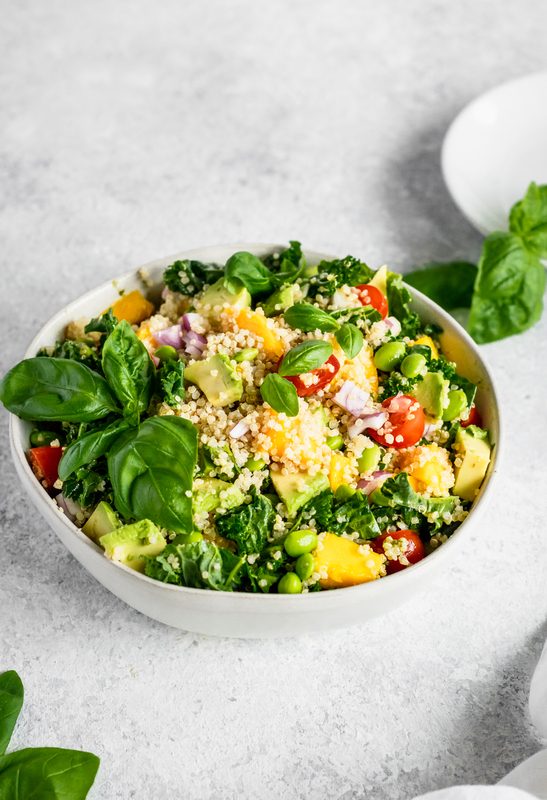 The happy ever after is that flavor explosion in your mouth: Juicy mangoes, red onion, grape tomatoes, creamy ripe avocado, nutty quinoa, crunchy kale, and edamame. This salad just might have everything I’ve ever wanted. I tossed it in a little lemony basil vinaigrette which takes about 5 seconds to mix together since it’s just a little lemon, garlic olive oil, basil, salt, and sugar. You can put it in a blender, or mix it up in a bowl (just make sure to mince the basil first). The longer the salad sits with the dressing, the better it gets. It’s just too dang good not to try! If you make this recipe, be sure to tag #ambitiouskitchen on Instagram, or leave a comment and rate the recipe below. First, cook your quinoa: Add quinoa and water to a medium pot and place over high heat; bring to a boil, then cover, reduce heat to low and cook for 15 minutes. After 15 minutes, remove from heat, fluff quinoa with a fork and transfer quinoa to a large bowl to cool down. In large bowl add your kale and pour half of the dressing over. Use clean hands to massage the kale for about 3 minutes or until it breaks down. This allows the kale to take on the dressing flavors. Next add in quinoa, edamame, diced onion, and remaining lemon vinaigrette; toss so that the salad is fully coated. 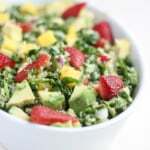 Before serving, toss salad again and add tomatoes, mango and avocado. Sprinkle toasted sliced almonds over the top. Serves 4. Great for meal prep, picnics or parties! 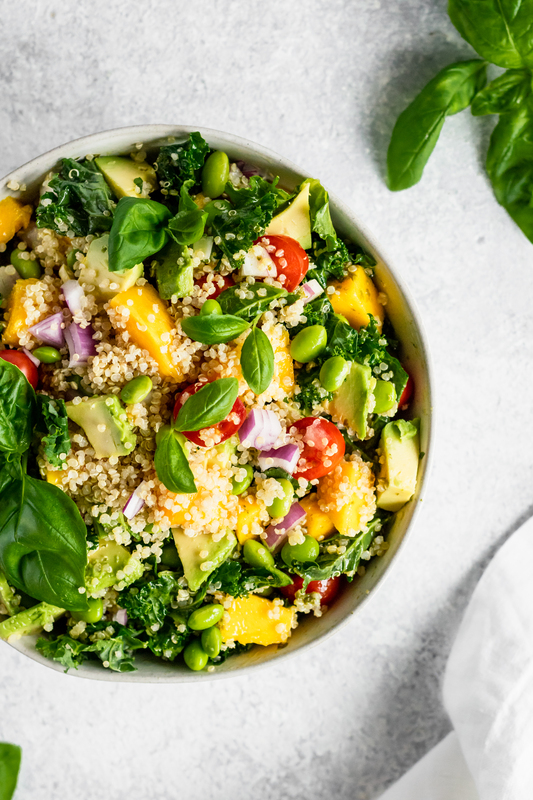 151 Responses to "Kale, Edamame & Quinoa Salad with Lemon Vinaigrette"
Wow, I came here from Foodgawker and while I generally read posts… I couldn’t take my eyes off of your photography. So beautiful! Oh no! Certainy you would reign in a guy with fantastic taste in food. Maybe you’ll get as lucky as I did, and find yourself a man whose idea of a great weekend is apple picking, pie baking, cider making, and spinach couscous with oranges and olives for dinner. The point is… not all dudes want Burger King or BBQ. Beer, maybe. But that’s a different story. I agree. You can reign in a man on good food. But it seems that some guys think if it’s healthy it’s girly and not manly. Men are notorious for being lovers of meat and potatoes. Quinoa? Couscous? Some men will go so far as to say these types of foods are GAY! I hate that. Toss them a prime rib and baked potato dinner and eat healthy with the girls. whoops hit submit on accident! aaaanyways….can’t wait to make this! This salad looks super fresh and totally delicious. I love the colors as well — if it’s pretty enough to eat, well…! Oh I feel you on the man-food vs our-food debate.. As an perpetually single girl with a recent man added to her life, I can tell you it’s going to be a hard transition. Him.. not me. I refuse to stop making kale salads! Anyways this looks like a beautiful dish.. simple, healthy and nourishing. Love the addition of mango.. I will be making a big batch this weekend! If you’re wondering if I’m stalking your blog, the answer is “yes.” 🙂 I made this salad last night for dinner and it was great! I almost didn’t add the mango but I’m so glad I did, it really added some nice sweetness to it. I found myself digging for more of the juicy pieces. And then I made the banana pancakes this morning and they were great too. Thanks for getting my out of my recipe rut! Your blog is great! Thank you for visiting. I’m happy you loved the salad; it’s my go to detox because it’s completely vegan and yet it fills you up! I would so love that Lemon Vinaigrette! This is fantastic! Thanks for such a healthy meal. Way too easy to make the sweet stuff! No decently ripe mangoes so I subbed mandarin oranges . Mmmmm……good substitute for color and sweetness of mangoes! I didn’t have mangos but dried cranberries are delicious in this salad!! A clean start to the new year, with banana/pineapple (only) ice cream for dessert. Cannot wait to make this as part of my meal plan for a cleanse from processed food! This looks sensational, can't wait to try it! Your poop is gonna awesome. This looks right up my alley as far as my pallet goes and amazing nutrition is the STAR of the Day! One of the best salads I’ve made – it was very fresh tasting. My husband loved it too. Hi Nancy! I’m glad you enjoyed it! 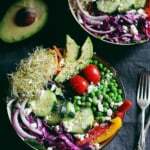 I have made this twice in one week – my family loves this salad! Thanks for sharing such a great and healthy recipe. Thought this sounded & looks delish Amy Cobb McGinnis : ). This was ABSOLUTELY DELICIOUS!!! Becoming one of my regulars!!! Is the sugar in the dressing absolutely necessary? Is there something else that could be substituted for it (other than artificial sweeteners). I know it’s only 1 teaspoon, but I try to avoid all refined sugar and artificial sweeteners. Try honey, or just simply omit it. The salad is perfect either way. Made it today, and it was delicious! Thanks for the recipe!! This salad was so good! I cooked the quinoa with chicken broth and added some chicken to the salad. Sorry, I'm not vegetarian! Made this last night & had to sub the kale with spinach & the edamame with Lima beans & guess what! It was super yummy! Yum!!! Can i come for Dinner???? Lori, how did the spinach go? I'm going to make it tomorrow with some spinach I've got to use up! Good thing with my boyfriend is that being a chef, he also loves good healthy food. And the occasional 400 g of beef with potatoes. Ugh. Making it for the second time in 3 days! So yummy & healthy! Any idea on the Weight Watcher points? I just can't eat mangos. Any ideas for a replacement. I can't wait to try this. I think any sweet tropical fruit would work well! Peaches, nectarines, tangerines, apples, strawberries. Made this, and the grownups in our house loved it. Thank you! love it all except for the edamame…soy is anything but healthy for you…do some research. other than that, really enjoy many of your other recipes as well. and good luck with the 'guy' thing. Monique, I just discovered your wonderful site! This kale, edamame, and quinoa salad looks great, and I plan to make it soon. Do you have a nutritional breakdown for it? Thank you for this delicious recipe! I was able to use the first veggies from my garden in it (kale and basil) and while I made a few adjustments (basically I threw in what veg I had in the fridge) I made your vinaigrette to the letter and it’s AMAZING. Can’t wait to keep making this salad all summer! This salad sounds absolutely awesome! I would have to skip the onion and my husband would skip the avocado (crazy man doesn’t like them), but this is something I would like to try. It’s just an intriguing combination of ingredients. Thank you for posting this. This salad is mental and even better the next day as leftovers! Monique you rock! This looks great and I want to try it but not really fan of mangos….. Any substitution suggestions? Or just leave it out? Kale from a farmers market and Niagara peaches (substituted for mango) made this salad a hit. Leftovers great for lunch. Ahh, summer! I've also made Monique's egg, avocado, bacon, jack sandwich and the chicken, chick pea chopped salad – all delish! Great recipe! I added some diced serrano pepper for an extra kick. Also I usually add ghee + sea salt to boil with the quinoa. The mango was a delicious treat. Ha don’t discredit all of us men so fast! Yes, the beer battered fried onions might be a bit hard to pass up.. However this is a great snack for even the manliest of manly men, especially after a day out in the mountains! Deliciously refreshing. Love! Love! Love! Seriously best salad ever! When I told my boyfriend I was making a quinoa salad for dinner his response was “Can I just have some potatoes?” I’m vegan and he’s not so we frequently eat different foods. But when I served dinner he tried my salad and changed his mind, the salad was so amazing! Thanks!! 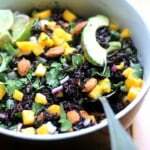 I had to substitute the mango with papaya and this was an amazing salad! Hi Elizabeth… so sorry for the confusion. The instructions do not say to cook the quinoa, that’s why the ingredients state 2 cups of cooked quinoa (quinoa that’s already been cooked). It sounds like you made the recipe differently and that’s why your nutrition results (and probably taste) is way off. And actually this is personally one of my favorite salads when made correctly. I hope you’ll give it another shot. In regards to all the comments about this not being manly…I think it’s pretty manly to be healthy! My husband weighs twice as much as me and he’s muscular and healthy and 100% vegan. That’s pretty manly. We will definitely be eating this tomorrow! Could this be prepped ahead in jars? I love to make things like this ahead of time and wonder how it would hold. You bet! I would just be sure to put the dressing on the bottom. Enjoy! 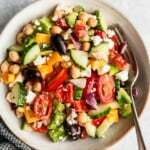 Love the fresh and vibrant colors and flavors in this salad! 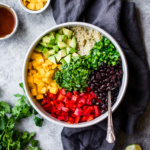 Loving all of the color in this salad! It looks so delicious. Edamame! It’s SO good! Edamame is such an underrated salad addition! This tasted fantastic! I made it the night before and the next morning add dthe mango and avocado. Delish! Massaging the kale with the lemon vinaigrette really makes kale taste so much better! YES massaging the kale is key! I’m glad you loved this one! I really did have it again for supper! 🙂 Thank you – I’ve made quite a few of your recipes and they are always wonderful. Lovely fresh flavors, packed with feel good super foods. Guilt free, tummy filling deliciousness.